Walking in Greece is hard work. In the states, people move aside to give the right away to the person who is coming towards them, so one might expect Greeks to do the same. But instead, they march straight ahead down narrow sidewalks with no notice of people coming toward them. Every approach is a contest of wills, a guessing game and/or a collision. No need to panic though, just step out of the way and let them go by. Come to think of it, perhaps they do walk the way they drive. It is a rare occurance for Greeks to give the right away to another car. This causes all kinds of arguments that then cause traffic jams. It is not uncommon to see drivers create two lanes where one is supposed to exist. Driving etiquette is non-existent in Greece. Drivers will not think twice to cut you off or tail you. Luckily, there is not the violent road rage phenomenon you see in the US. 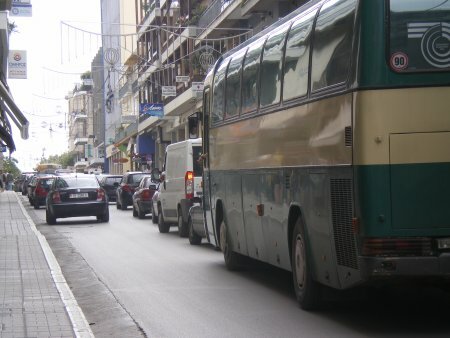 In congested traffic, many Greek drivers don’t believe in turn signals, pedestrian right of way, or even stoplights. If there’s a traffic jam up ahead, it’s perfectly acceptable to drive on the sidewalk in order to bypass stopped cars, especially if you’re on a motorcycle. Seat belts are rarely worn. My favorite has to be the overuse of hazard lights which is fairly common. Whenever a driver wants to stop in the middle of the road to have a chat with a friend and can’t be bothered by getting out of the car, or decides to double park while waiting for someone, out come the hazard lights. They seem to guarantee the driver who switches them on some sort of immunity and all fellow drivers will give you the benefit of the doubt and let you get on with whatever you are doing. No one beeps their horns or shouts at you if the hazards lights are on. Parking in just about every major city can be a nightmare. Major traffic problems here are due to a large consumption of cars and lack of parking. Parking on side walks is common and double parking as well. If someone blocks the street, horns are held continuously until someone moves the car – this can take minutes. There is full service at gas stations which includes washing your windows, checking your oil and tires. There is no self service stations in Greece. This entry was posted in Walking and driving and tagged driving and walking, Greece, Greek life, Greek Traffic, Parking in Greece by expatdiane. Bookmark the permalink.